I did this walk on the 28th January 2007, taking the train to Cheshunt Station from where it was 1.2 miles back to rejoin the New River Path by Church Lane. Heading down the canal, photo 1, the path runs more or less parallel with the A10 for a while. Soon after joining the river I saw a variety of birds including moorhens, coots, swans, little grebes, and quite a few Mallards and geese. The day had started grey and overcast but as I started walking along the river bank the sun came out and it stayed generally bright for the rest of the day, far better weather than when I had ended the first stage a few weeks earlier. From Cheshunt the route heads down the river bank towards Bury Green, photo 2. 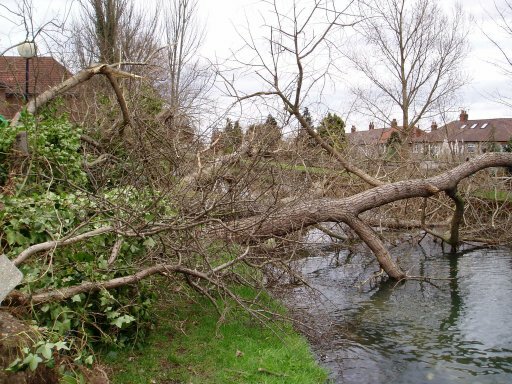 Soon after crossing College Road I came across a fairly sizeable tree that was completely blocking the path and much of the New River as well, photo 3. Fortunately I was able to squeeze my way over, and under, the branches to continue my way down the path. A little further on past the fallen tree, as the river makes it way towards the B 198, the New River passes across open ground between two fields, photo 4. This is one of the first times the river has been in an open rural area since it has left the Meads back near Hertford. Coming round a corner of the river after crossing the B 198 you could see the hills of Epping Forest away to the left, photo 5, and a bit further on in the far distance the towers of Canary Wharf also appeared on the skyline. The path continues to makes its way along the bank besides an open grassy area, photo 6, towards the M25. The New River path crosses the M25 on a broad and rather dull aqueduct, photo 7. The New River being completely enclosed in concrete and tarmac as the cars below negotiated their way through the roadworks below. Crossing the Bullsmoor Lane besides the grounds of Capel Manor the path enters a more built up residential area with houses down to the left and playing fields to the right. An indication of how mild the weather has been recently was that in one of the back gardens a man was mowing his lawn - in January! The path then briefly diverts away from the river bank heading along a rather narrow and muddy path besides a playing field while the New River takes a short aqueduct over Turkey Brook, photo 8. Once over Turkey Brook the path climbs back up to the riverside and briefly joins the route of the London Loop. The path along the New River bank was closed at this point, photo 9, and thus I had to divert along the London Loop down to Forty Hill. There were also a few signs for a New River Link path which I started following but the signs seemed to be leading contradictory directions. Returning to the diversion, I headed left up Forty Hill towards Goat Street. On the way I past the very impressive Jesus Church, photo 10. Reaching the top of Forty Hill I then turned left down Goat Lane which led back down to rejoin the New River Path, near some blocks of flats which were in marked contrast to the nice houses that I had passed earlier at the top end of the road. Photo 11 was taken looking back towards where I was able to rejoin the New River after the path closure. Sadly only a short distance further along at the next road crossing there is once again no access to the riverbank alongside the New River and the path turns left along Carterhatch Road and then sharp right down Ladysmith Road, photo 12. The path goes along the road through the barriers blocking the road to through traffic, past a footpath off to the right which does not give access back to the river, and on for some considerably distance down to Lambourne Gardens. Here the route turns right to briefly rejoin the New River before taking a footbridge over the River that leads into a footpath that runs between houses to Carnarvon Avenue. At this point I deviated from the correct route of the New River Path as I turned left down Carnarvon Avenue, then continued into Apple Grove, roughly following the route of the New River as it runs behind the houses. From Apple Grove I turned left into Peartree Avenue then left again into Willow Road down to Southbury Road. Turning right into Southbury Road I passed a New River information board that gave details of the New River Loop in Enfield as well as pointing me in the direction of the correct route of the official New River Path. I continued along Southbury Road and turned right up Silver Street which runs past the Enfield Civic Centre into Baker Street where at the junction with Parsonage Lane I re-joined the correct route of the New River Path. At this point the route continues to the left along Parsonage Lane but I turned right to walk the stretch of the New River Path from Carnarvon Avenue that I had missed out. Back at Carnarvon Avenue this heads along a footpath running between houses, photo 13, to Churchbury Close where the route turns left into Churchbury Lane and soon after right into Parsonage Lane. Back on Parsonage Lane the path turns down a footpath off to the left to rejoin a loop of the New River running alongside Holly Walk. This stretch of the New River was by passed in 1900 when a more direct route was taken through Enfield. From here the New River passes the Crown and Horseshoes pub, photo 14, and goes along a very attractive stretch of path lined with old houses, before crossing over Windmill Hill and heading down beside the Town Park. At the end of the park, besides a pond the New River Path leaves the route of the water course and heads steadily uphill towards Carrs Lane, which runs through the grounds of the Bush Hill Park Golf club on an enclosed lane, photo 15, that leads to a road, Bush Hill, by the Golf club entrance. Leaving Carr's Lane the route turns right along the road, past some grand houses before continuing on into Bush Hill Road as the route starts descending gently. Heading along the road I noticed that the route had now entered the London Post code area. A few hundred yards further on the path finally rejoins the route of the New River proper, opposite an old sluice, built in 1745, photo 16. However, once again the path soon has to divert back to the roadside as the New River goes over the Clarendon Arch which carries the New River high over Salmon's Brook, photo 17. At the end of Bush Hill the route turns left onto Ridge Avenue where the New River is re-joined. The route passes through Winchmore Hill, past the grounds of Winchmore Hill cricket club and the Highfield pumping station, photo 18, as it makes its way steadily towards Central London. Just passed the Highfield pumping station I passes a small black crane, one of many that I had passed on the walk although not previously photographed, photo 19. Close by where a flock of tufted ducks, photo 20. At Barrowell Green the route once again leaves the river and heads onto Green Lanes before turning left down River Avenue which is followed to Hedge Lane where the New River can once again be joined. The continued diversions from the river bank were getting pretty frustrating, particularly as in many cases I could see no reason for them. Crossing Oakthorpe Road the route crosses the Pymmes Brook Trail which I had walked last January. Almost immediately I came to a very big fallen down tree which was blocking the path, photo 21, however I was able to climb under the branches onto its trunk and walk over the obstruction, the photo does really not do justice to the size of the tree. The path then turns right onto Green Lanes, left into Broomfield Way and left into Shapland Way, effectively going round three sides of the Palmers Green library to rejoin the river, photo 22. At the A 406 North Circular the path takes a little detour along the road to the right to cross over a footbridge, photo 23, before heading back the other side of the road to the river. Once again the route soon leaves the river side at Elvendon Road which is followed to the left into Palmerston Road. The route heads to the right down Palmerston Road where once again I experienced more confusion with the route. This is supposed to rejoin the River from Palmerston Road but I did not notice the path and headed up Myddleton Road instead which was the wrong way as the route actually leaves the river again Myddleton Road and heads down the way I had come back to Palmerstone Road. I eventually figured this out but while I was looking at the New River signboard I met up with another couple who had also lost the route of the path. From Palmerston Road the route turns right into Truro Road and left into gardens that runs over the top of a covered over part of the New River. This thin strip of non built up land is followed down between houses to Station Road N22. The route heads down to the left along station Road for a short distance before taking a path that skirts round the edge of Wood Green Common, photo 24, into the rather shabby Western Road. 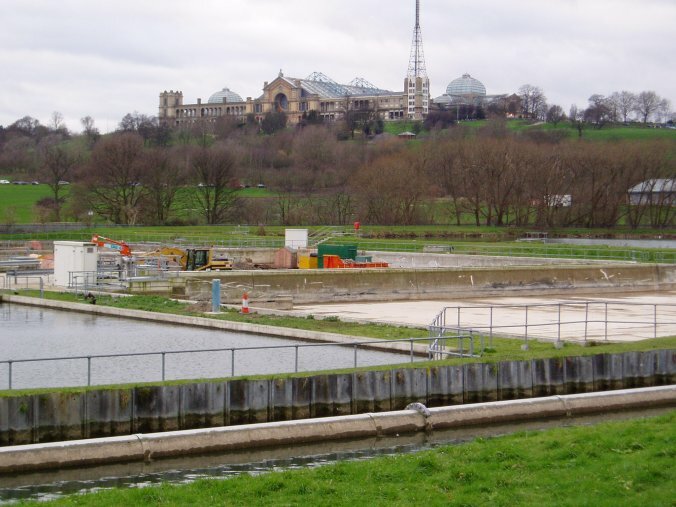 From Western Road the route takes an unsigned tunnel under the railway lines that run to the right of the road which leads back up to the New River by the Hornsey Waterworks with views over towards Alexandra Palace on the hillside above, photo 25. There was a lot of work being undertaken on the path in this area although none was actually taking place on the Sunday when I walked past, photo 26. A sign said the path was closed from the 8th January while the work was being done but the fence was lying down so I assumed it was open and thus I continued on along the New River down to Turnpike Lane where I ended this stage of the walk. I did however to climb out onto the road from where I made my way to Turnpike Lane tube station, leaving the route of the New River Path at the junction with Wightman Road, photo 27, for the short journey home. Including the walk from Cheshunt station, my diversion round Enfield and at Forty Hall, the total distance I walked for the day was 13.3 miles.